Time is valuable, and you probably don’t have much of it, right? When it comes to marketing and growing your business, you’re often overwhelmed with options and aren’t sure where to start. It’s not clear where you can get the most bang for your buck or move the needle in a limited amount of time. Good news, this post might just hold the answer. Note: we mention Greenville (our wonderful city) in this post a few times, but know that everything in this post is entirely relevant, regardless of your city. Feel free to skip ahead if you’ve got a grasp on the basics. 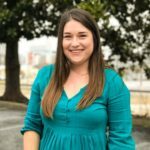 But first – what is SEO? SEO is an acronym that stands for Search Engine Optimization. SEO is a way to gain more traffic to your website by ranking highly for searches on websites like Google. There are signals and factors that Google takes into consideration when ranking pages for a search query. SEO is the practice of tapping into those signals and factors in order to make your web pages rank better for relevant searches and earn quality website traffic. When we talk about SEO, we’re talking about the organic results on search engines – in other words, just about everything that isn’t an ad. 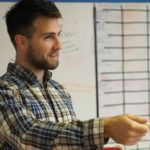 What is SEO and How Does it Impact My Business? Local SEO is the same idea, but within a local vacuum. Local SEO is the attempt to rank highly on sites like Google for a local audience. So if you work with people in the same vicinity where your business is located, most of your search engine optimization efforts will be Local SEO efforts. In order to fully explain local SEO, we first have to mention search intent. When you go to Google to ask a question or find something, Google is making an attempt to serve you the exact results you’re looking for. Search intent refers to the reason why you’re performing a specific search. 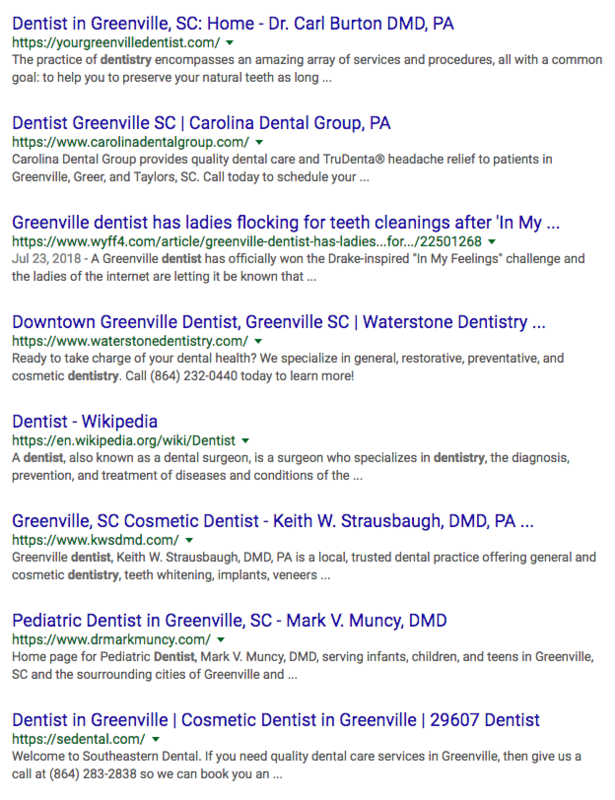 For instance, when you search for “dentist,” are you looking for general information on dentists? Are you looking for median salary for dentists? Or are you looking for a new local dentist? As you can see, other than a knowledge panel (what you see to the right of the map) and an article from Wikipedia, we’re looking at almost 100% local businesses in the results. Obviously if you were to add “in Greenville, SC” to the end of the search, you’d see much of the same. But the point here is that even if you don’t add what we call a “local modifier,” you’re still getting local businesses in the results. Try it for your industry and see if Google gauges your intent as local. This is Local SEO: any search that displays primarily local results. As you can see, three lucky businesses get the honor of landing in what we call the “Local Pack” or the “Map Pack.” This map will almost always display three search results. The factors that go into how these results are ranked are very similar to the factors that determine the 10 organic results beneath. However, the local map pack places a bit more weight on location and proximity. You may even notice that the map looks a little different for a “near me” search v.s. an “in my city” search. To Google, “near me” indicates you’re interested in the closest business you can find, opposed to someone in your zip code. If you’re a local business or organization this is something you want in on. It’s extremely valuable internet real estate. So we know what it is, but how many people are really making these kinds of searches? And when they do, who’s getting all the clicks? In 2017, 97% of consumers looked for a local business online, and 28% of searches for something nearby resulted in a purchase. There’s no denying that people are taking to Google to find local businesses and service providers to meet their needs. In fact, in the past three years, there has been an 85% increase in “where to buy” searches. Even as big box stores and online retailers grow, people are still looking for local retailers. One of the most common push backs we see to investing in local marketing efforts is the idea that word of mouth is all a local business needs. While there’s no denying word of mouth continues to carry weight in buyer’s decisions, there’s also no denying that people are heading to Google more and more often to find local goods and services. But the reality is that purchase decisions – including the decision to go with a new service provider – are changing. 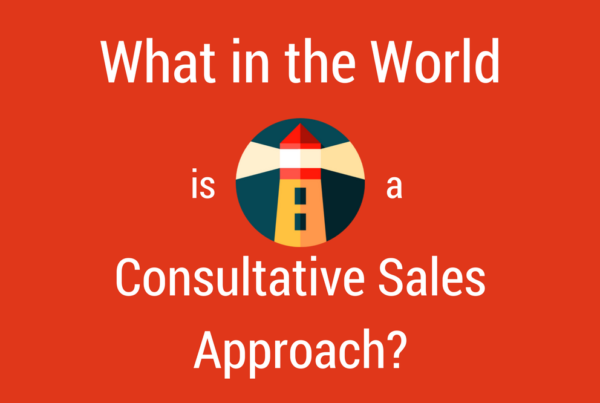 They’re becoming multi-faceted as people are consulting multiple channels in their search. 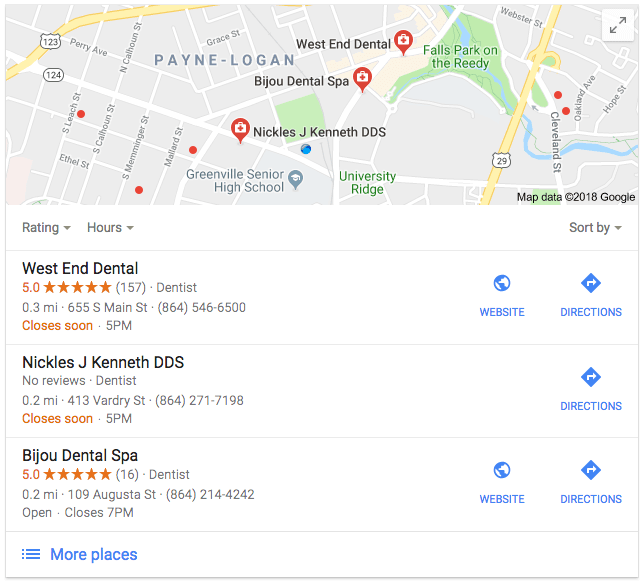 The decision to go to a new dentist probably looks like a combination of word of mouth suggestions, Google searches, and skimming through reviews. Who is Earning the Search Traffic? The majority of clicks from locally intended searches go to the results in the local pack, making this the most valuable real estate on a local search results page. So how do you get into the local pack? There are countless signals that go into the local search algorithm – meaning Google looks at many different factors when they rank the results on a local Search Engine Results Page (SERP). We’re going to take you through 5 of them, and show you how you can optimize each. Keywords are going to be a foundational element of any SEO campaign. You don’t just want your site to show up on Google, you want it to show up for specific and relevant searches that are occurring in high volume. There are countless keyword research models and strategies. 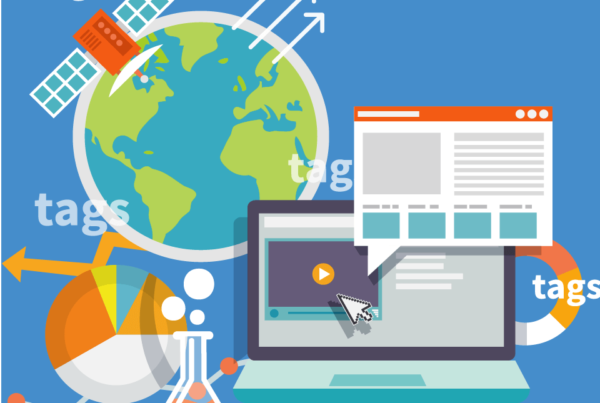 Make sure your site is optimized for your services and your location. We won’t delve into keywords and on-page optimization in this post, but here’s a handy guide that should help you get started. When it comes to local marketing, your Google My Business listing is absolutely vital. 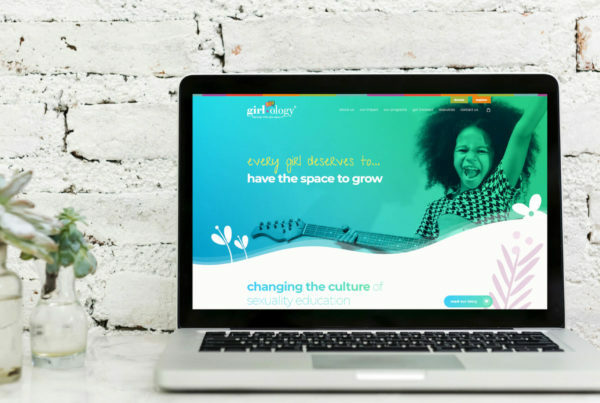 Think of it as a second website homepage. Because it’s so close to home for Google, most believe it carries more weight than any other citation or mention of your business on the web. 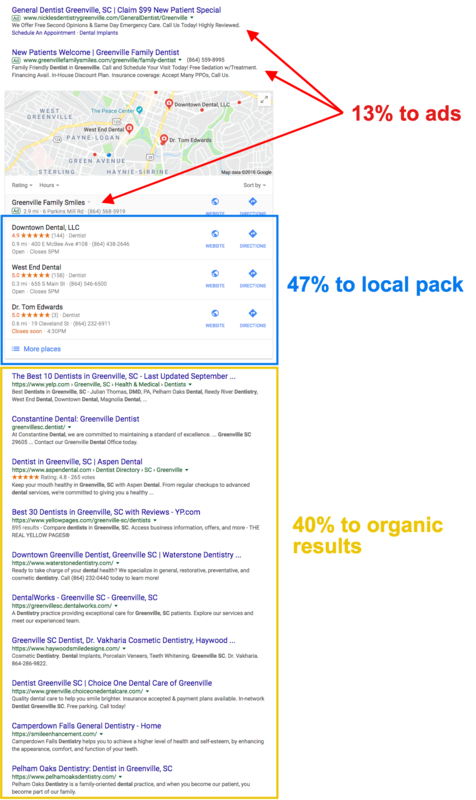 According to Moz, it is the most important ranking factor for local pack results. Type in your company’s name and location into Google and see if your Google My Business listing appears in the right hand sidebar. If so, good start. If not, you need to create one! Here’s a quick how-to guide from Google. If your business does appear, you need to claim your listing. Here’s a guide on claiming and verifying your GMB. This is the minimum amount of information you should include on your listing. When it comes to photos, we’d recommend your logo, a photo of the exterior of your location, and a photo of the interior. Bonus points for photos of the team at work. Two recent additions to what Google My Business offers are a business description and posts. The description is a great place to pitch yourself and your services while using relevant keywords. Posts are an easy way to let customers know about updates, deals, or upcoming events. NAPs is an acronym that stands for name, address, phone. Instances of these three indicate to search engines who you are, where you’re located, and how someone can get in touch with you. It’s important to have your NAP on your site, but you should also ensure that other instances of it across the web match what’s on your site and on your Google My Business listing. We typically recommend putting your NAP in your footer, and also in the body of at least one page on your site. Put simply, a citation is an instance of your NAP on the web – most often found in local and industry directories. Citations help build credibility and let Google know you’re legitimate. Clearly they’re important. So what do you do? Where can you find 85 websites willing to list your business? 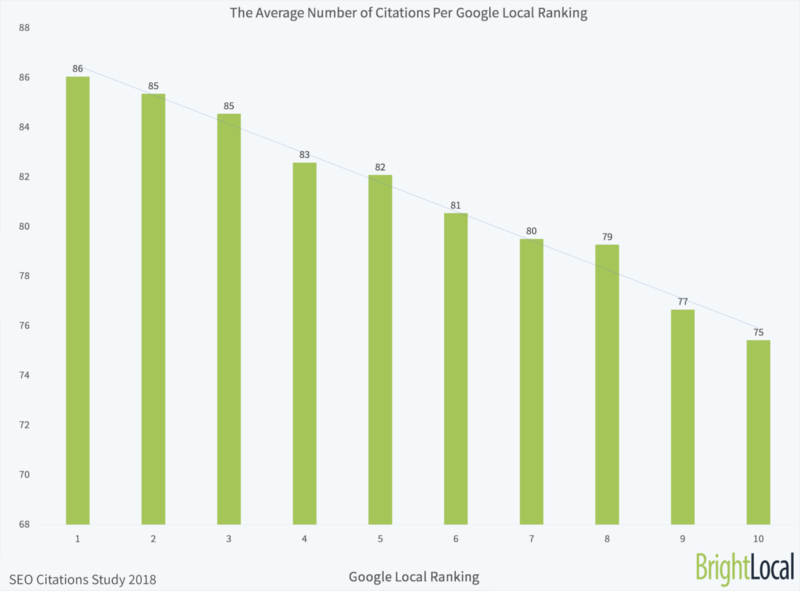 These are more foundational citations – as in, if you don’t have them, adding them can give you a significant boost in local ranking. Think the obvious directories like YellowPages, Yelp, and even Facebook. You need to make sure you have a listing on each of these sites first. I know what you might be thinking: “None of these will help me get business, no one actually uses these.” While it’s true way more people rely on Google to find this type of information, having listings on these sites will help build your ranking potential on Google. In addition to these generic, local directories, it’s important to have listings on industry-specific niche directories as well. BrightLocal provides an awesome resource showing you the most important citations for your industry. Reviews continue to carry more and more weight in search ranking. It makes sense that Google would want to send you to a reputable business. Moz believes reviews carry a little more weight when it comes to the local pack, but is also a key factor in local organic results. Unless you are a restaurant or someone is really mad at you, it’s unlikely you’re going to rack up reviews without asking for them. Create some sort of system where you ask following the completion of the sales process – whether that’s an email, an in-person ask, or even a text message. You may have heard that it’s important to respond to negative reviews, but you should also respond to positive reviews! Try not to make every response sound the same, and don’t be afraid to personalize if you know the reviewee. Google is pretty clear that you shouldn’t offer incentives or bribes for reviews. They should be organic. Would Google have any way to know if you incentivized a review? Probably not, but if they ever find out a way to do so, rest assured you would feel their wrath. Links remain one of the most critical ranking factors – in local and non-local searches. We’ve listed it last because it is something that can take a little time, unlike the above factors, which are lower hanging fruit. If you have partners or vendors who mention you on their sites, don’t hesitate to ask them for a link. If you are in association with other reputable and credible organizations in your area this is a great way to let Google know you are credible as well. Any time you have a new hire, host an event, or just have a company update that’s newsworthy, submit it to local press. And if your story gets picked up, don’t be afraid to ask for a link to your website if they don’t give you one. This is another easy (though maybe expensive) way to pick up links. It’s also a great way to build brand awareness. A local survey that others in your industry would find valuable is a fantastic way to build links and buzz. For instance, as a dentist, a study asking 100 people how often they floss could be the kind of content that others in your industry would find valuable and consider linking to or sharing. 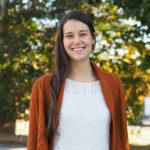 Enjoying this round-up of local seo tips? Stay ahead of local SEO trends with insights delivered to your inbox. Bonus: What if My SERP is Cluttered with Listing Sites? Make sure you’re in the local pack. That is real estate that will remain actual local businesses. Granted, you can now pay for ads within the local pack, but there should always be three local businesses there. Make sure you have listings on those directories. It’s an “if you can’t beat them join them” approach. Do what you can to rank well on those, unless it’s a directory you feel isn’t legitimate. So there you have it: almost everything you need to know about Local SEO. We really believe these tactics can move the needle for you without taking up all of your time. And if you have more questions or want to dive a little deeper, check out the below resources.